The localities that make up the council of Villaviciosa are in many valleys that converge towards the coast. Valleys surrounded by gentle hills with the peculiar green color that gives the vegetation that covers them. For them run numerous coastal streams, small rivers of short course and little volume whose confluence forms the estuary of Villaviciosa, declared natural reserve by the Principality of Asturias. The council of Villaviciosa, in its 23 km of coastline, has 7 beaches, from the eastern, Misiegu, Rodiles, El Puntal, Bowls, Meron, Spain and La Nora, embedded between soft cliffs and surrounded by lush vegetation. In many of these cliffs they can appreciate the traces left by dinosaurs before their extinction 65 million years ago. History shows that the first signs of settlements in the municipality date back to prehistoric times. There are vestiges of Paleolithic, Neolithic sites, castreños and Romans. Villaviciosa, "Villa-fertile", originated in Puebla de Maliayo, who founded Alfonso X the Wise in 1270. You can not forget to mention the architecture, the mariñanas houses, granaries, bread baskets, flour mills and, of course, the llagares, which are a true reflection of traditional life. Also it emphasizes the artistic value of some of the works of carving and imagery, as the Virgen del Portal Antonio de Borja. Among non-religious sculptures highlights the village of Mariano Benlliure and Park Eduardo Ballina Úrculo. If we refer to other leisure activities, it is not possible to list all the festivals and pilgrimages that take place throughout the year. Every town, every village has many traditions that make it possible, with incredible frequency, traditional costumes and music of bagpipes demand the attention of residents and visitors. And, as a final note about the gastronomic delights offered by these lands, which are the subject of countless gastronomic days throughout the year. All these dishes acquire its splendor accompanied by the traditional drink of these lands: cider. 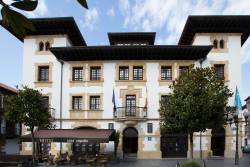 Villaviciosa, with five other councils make up the Commonwealth of Sidra. Since 1960 the Festival has been held on the block. Dessert apples and cider receive their awards, as do the best pourers of this wine. The Cantabrian Sea is prodigal in fish and shellfish that are the basis of a food culture that not only offers variety but a remarkable quality. Desserts, among which we must mention the Villaviciosa tart, apple jam and, of course, rice pudding.